What Is Apache James Protocols IMAP4? A library providing a flexible codec for IMAP4, command processors and a sample data access layer. In combination with a socket layer, and a mailbox persistence, this library can be used to create an IMAP server. RFC 2060 IMAP4rev1 is functionally complete, tested and usable. The data access layer is still under optimization on performance perspectives. API is susceptible to change. You can download current 0.3 release. The API are susceptible to evolve. We have integration tests for IMAP. Our implementation is also tested against external tools such as http://www.imapwiki.org/ImapTest. 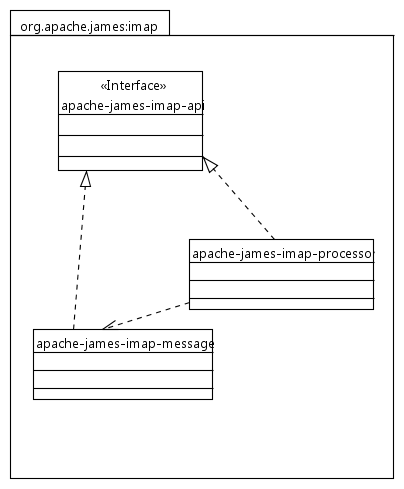 Apache James Server 3 supports IMAP (using this library). The source code page contains information on how to develop on James IMAP.